Yesterday a group of staff and students from AHO that talked about design and the role of 3D at the Sent arrangement hosted by Teknisk Museum in Oslo, Norway. The event in an informal mix of lectures, debate and music, aimed at an audience of young grown-ups. The talk was held by William Kempton, with contributions from Maria Berg-Leirvåg, Aslak Sødal, and Hans-Martin Erlandsen. 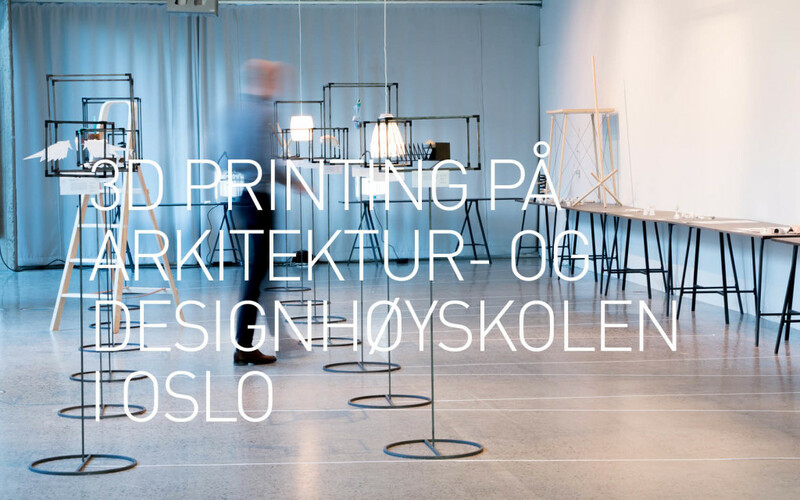 Titled DESIGN+PROSESS: 3D-PRINTING PÅ ARKITEKTUR- OG DESIGNHØYSKOLEN I OSLO, the main topic was which role design has for the exploration of 3D printing as a design tool. The technology, which is in principle capable of producing physical artefacts in a variety of shapes and materials, was introduced and explained. 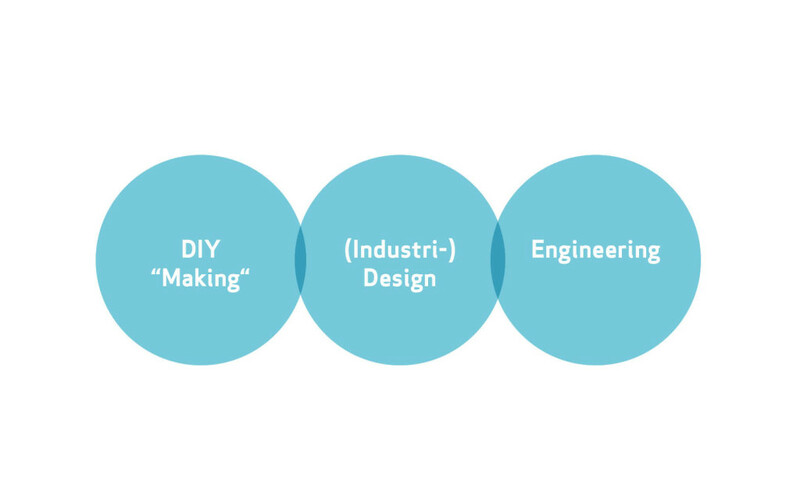 It is the concern of many different social groups and disciplines, from the Maker-Movement to Product Design practise. Differences and motivations between these groups were explained, through examples from Product Design students at AHO. 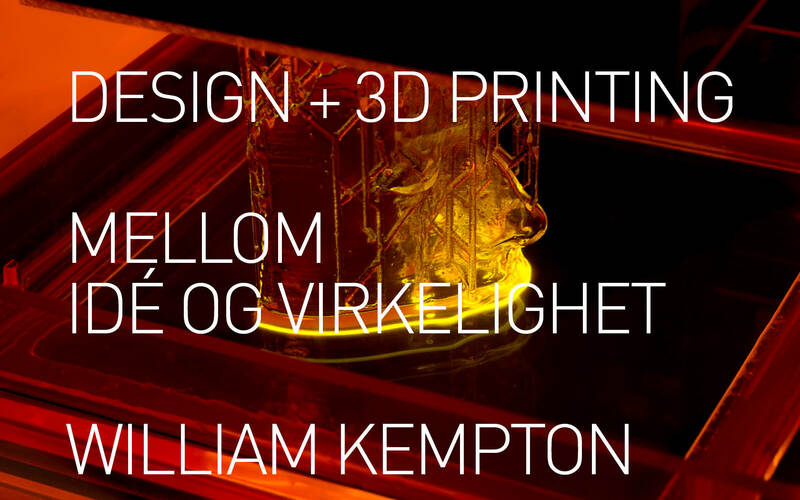 Hi, and welcome, my name is William Kempton, and I am currently doing a PhD at AHO, investigating the relationship with Product Design and emerging technologies, such as 3D printing. 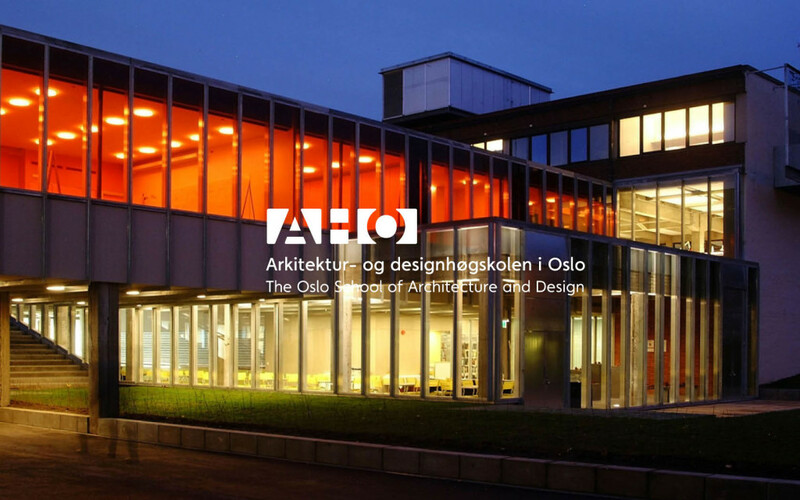 The Oslo School of Architecture and Design has a long tradition of teaching Industrial, Interaction and Service Design, as well as Architecture. 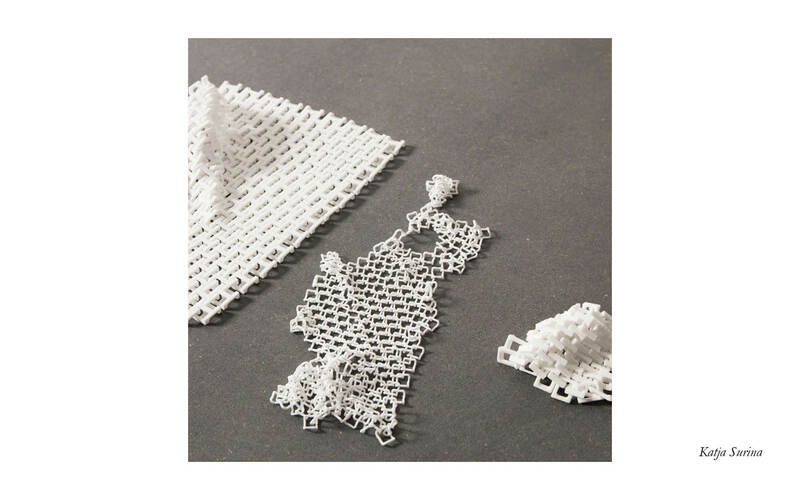 The context of today’s talk is a course which was held in the autumn of 2015 with students from both Architecture and Design studies, titled ‘3DX14 – 14 approaches to materialising form through 3D printing’. It was held by William Kempton and Geir Jarle Jensen. 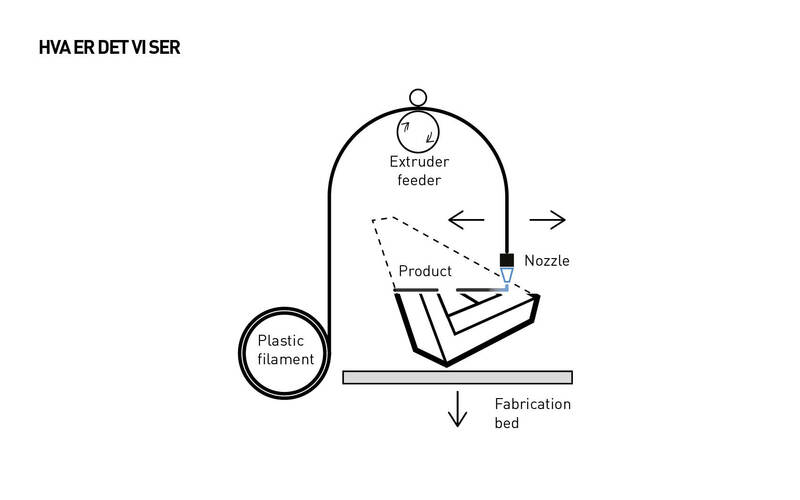 So what we see here is basically a robotic arm which is extruding a clay material in layers. Its instructions come from a predetermined form. 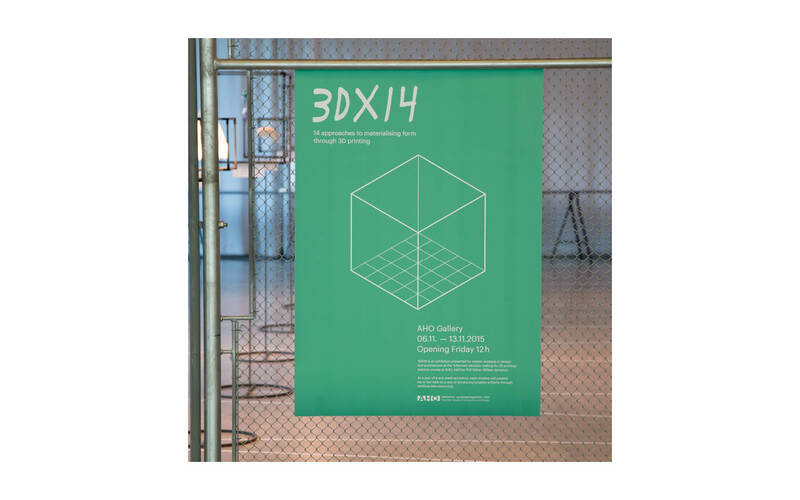 The machine deposits material in an X and Y axis before moving its Z axis to from a 3D object. This concept is the most common method for desktop 3D printers. Of course what most people associate with consumer 3D printing are the colourful plastic materials. There are in fact many different 3D printing techniques that allow us to make items in a whole range of materials, from gold, silver, to wood-grain, titanium and clay. In order for us to understand more of how 3D printing works, it is important to understand that the machine is a replicator. In order for something to be made, there has to be an original, digital blueprint. This is usually made in a CAD program. 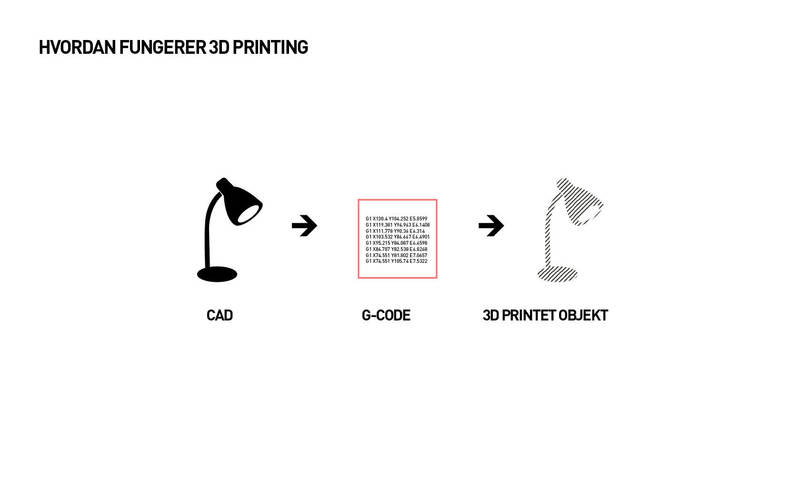 The 3D file is then translated into a language that is understood by the 3D printer, before it is made. 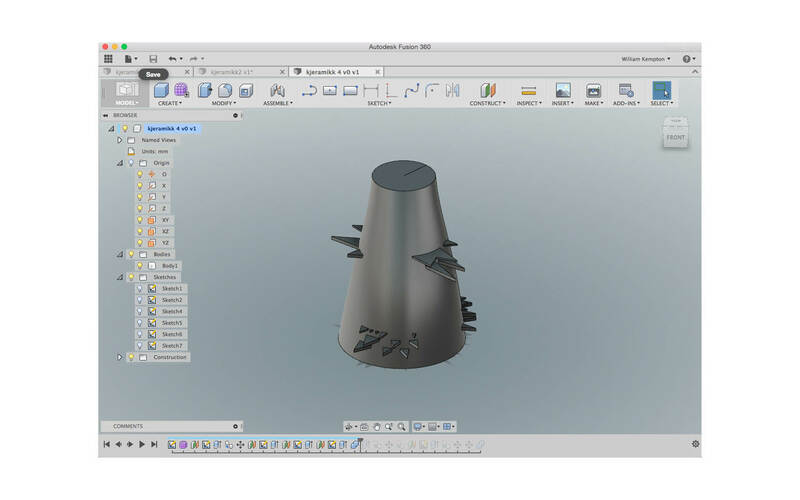 The following image shows a simple conical shape that is made in such a CAD program (Autodesk Fusion 360). Notice the intricate details that are seen on the conical surface. The shape is made in perfect detail. It the digital space this models is impeccable. However, when it is reconstructed in the physical world, there is an interpretation being done by both the material as well as the machine. Notice how the pointy details on the surface are interpreted in a completely different way. This abstraction is a very important consideration when designing for 3D printing. 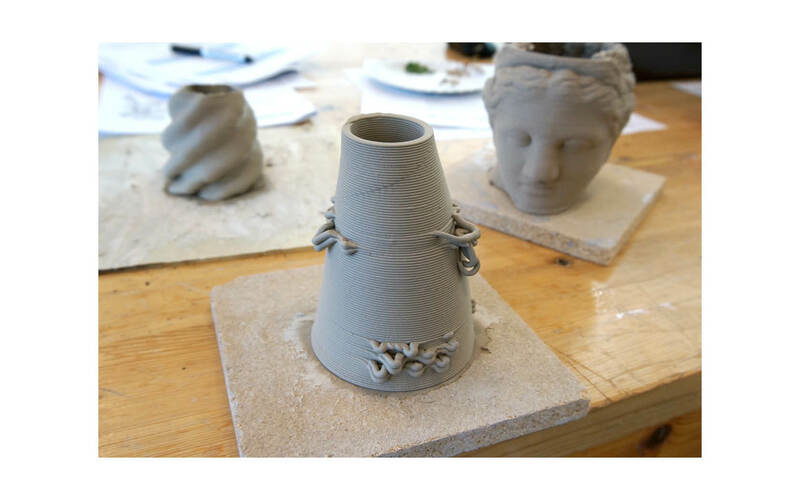 Generally there are 3 tentative possibilities for end use 3D printing. 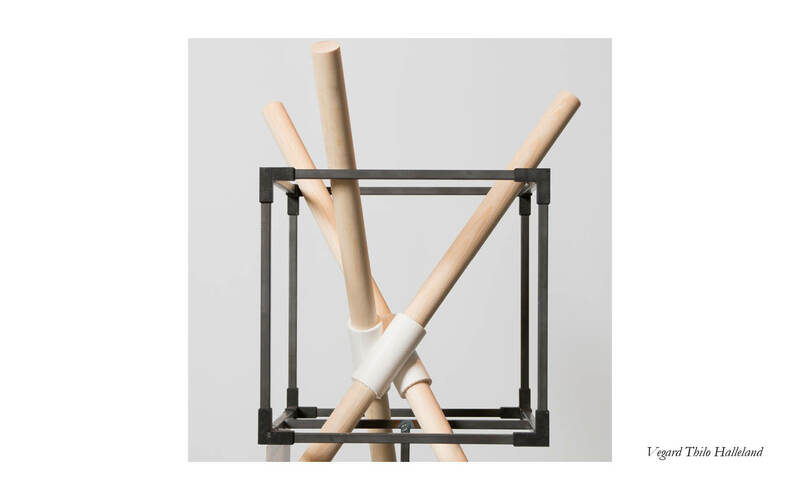 Enhanced Design (optimalisert) refer to the material and freeform abilities of the technology for making artefacts that would not be made feasible in any other way. 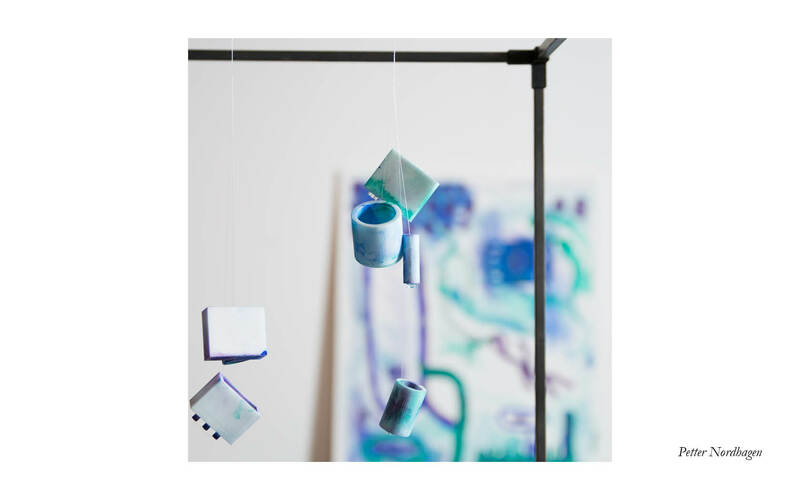 Custom Design (tilpasset) takes advantage of the ability to create unique, one-of-a-kind artefacts for special needs. 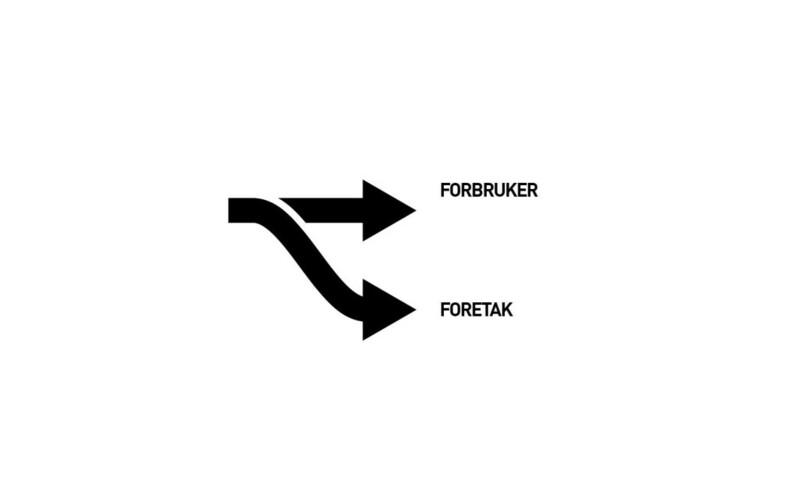 Computational Design (algoritmisk) takes advantage of the digital input the decides the physical output. Whereas 3D printing has originally used for developing prototypes for product development processes, there has been a recent proliferation in materials and techniques. Seen here is a one-of-a-kind engagement ring made for my wife Lisa. Two different churches, a Norwegian stave church and the cathedral of Pavia are symbolically placed on a bridge. 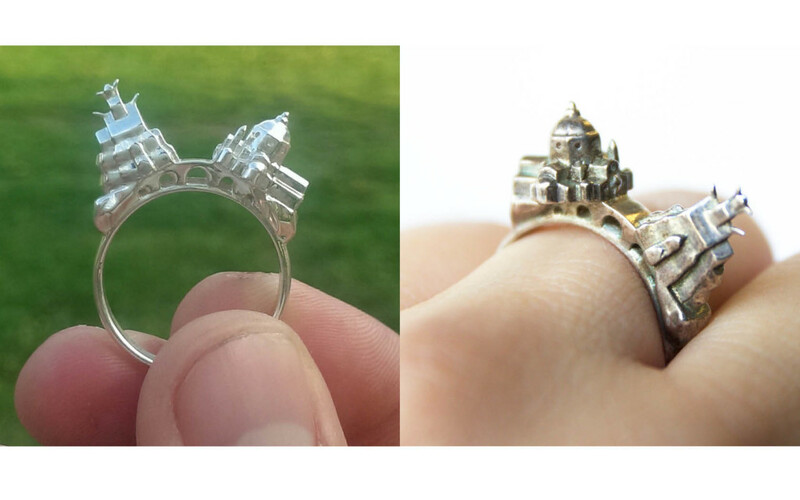 It is made from silver using lost wax casting. We have talked a bit about how the technique works and some of the uses. 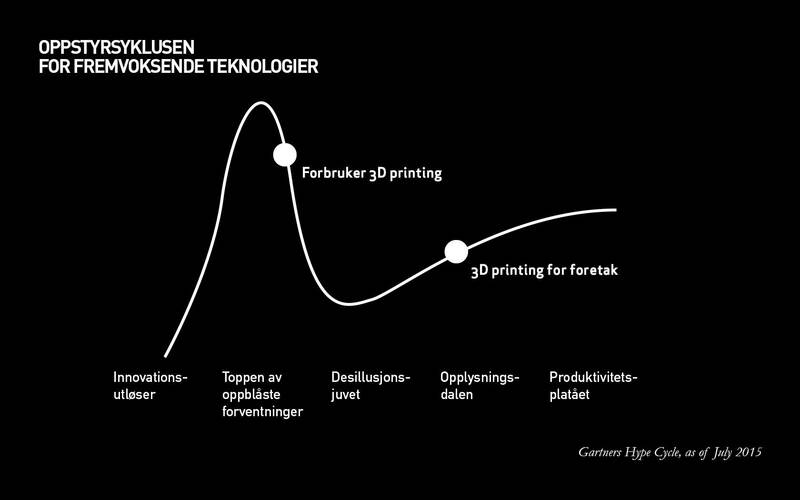 Let’s turn to how 3D printing us evolving and some future directions. 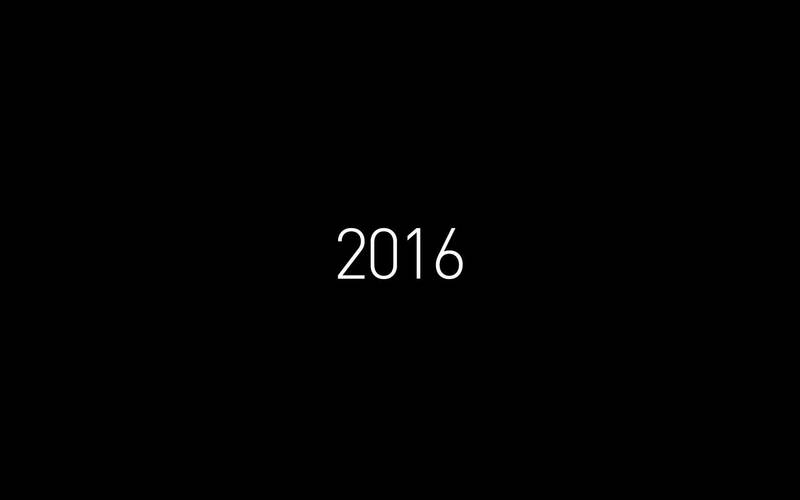 We are in 2016, and 3d printing has been present in the media hype since around 2011. Gardner is an advisory company for information technology that each year make a prediction for technology trends with it’s Hype Cycle. Considering the amount of debate related to self-driving cars in the media, it is safe to say that it is at the top of inflated expectations. 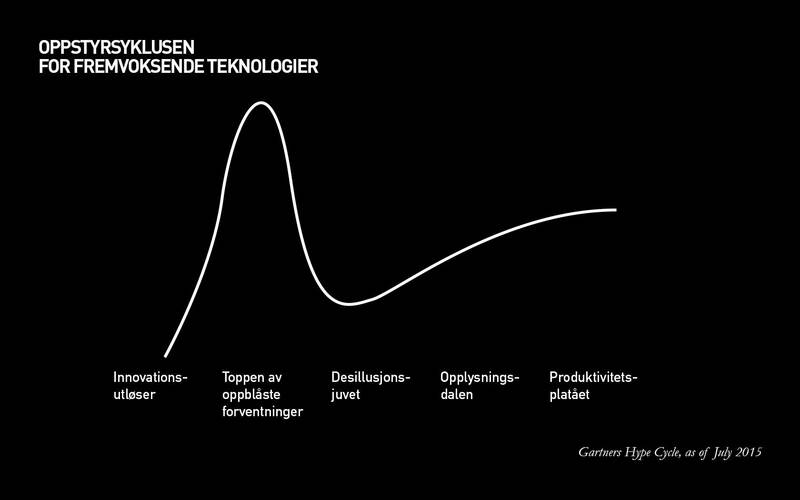 But as every hyped technology, there is an inevitable decline. 3D printing partially finds itself in this position. Notice how that 3D printing is referred to as to separate things. Consumer 3D printing and Enterprise 3D printing. While one in on its way down the trough of disillusionment, the other is in fact on its way up the plateau of productivity. They are no longer the same. We now find ourselves at Teknoteket at Teknisk Museum. 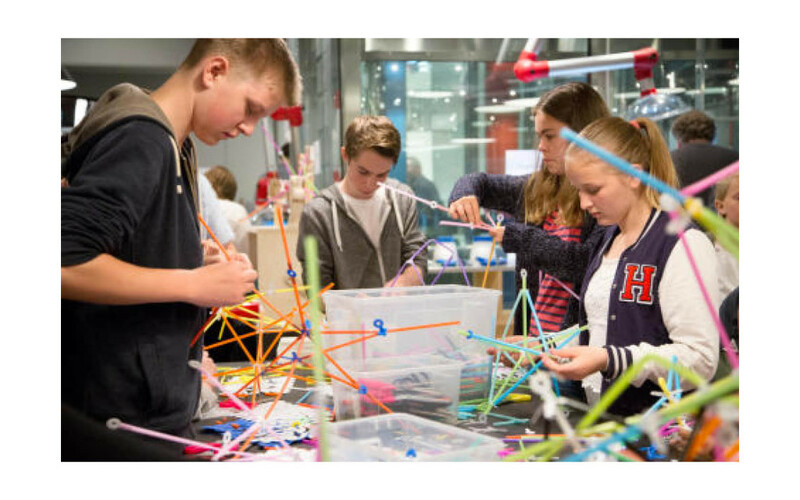 Like so many of the makerspaces that allow people to engage in creative making, it has become a place for users to engage in 3D printing with desktop printers. 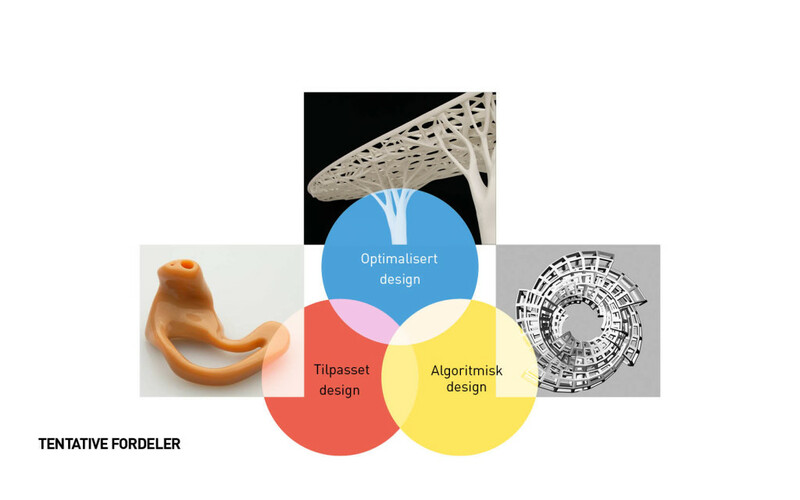 We can go even further and say that 3D printing is pursued in three different areas. 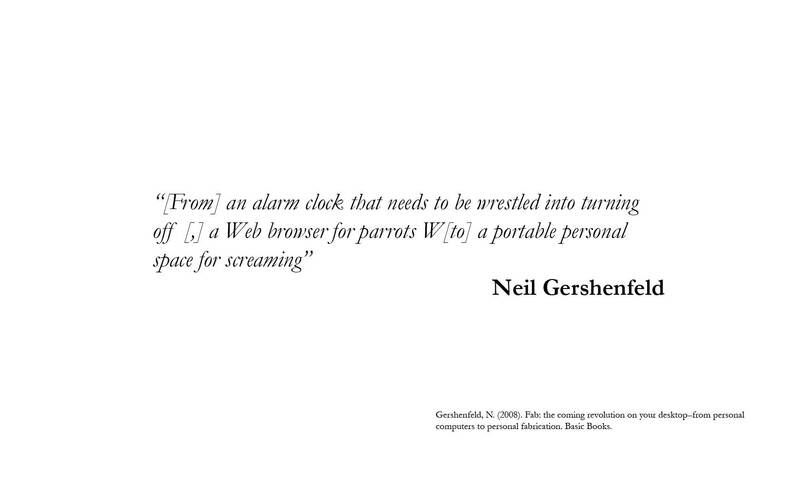 It is taken up in DIY, where users are motivated by the desire for self-making. In design, as we will talk more about later, it acts as an integrated tool for product development. In its most pure form, it may be used as a method for creating end use items. 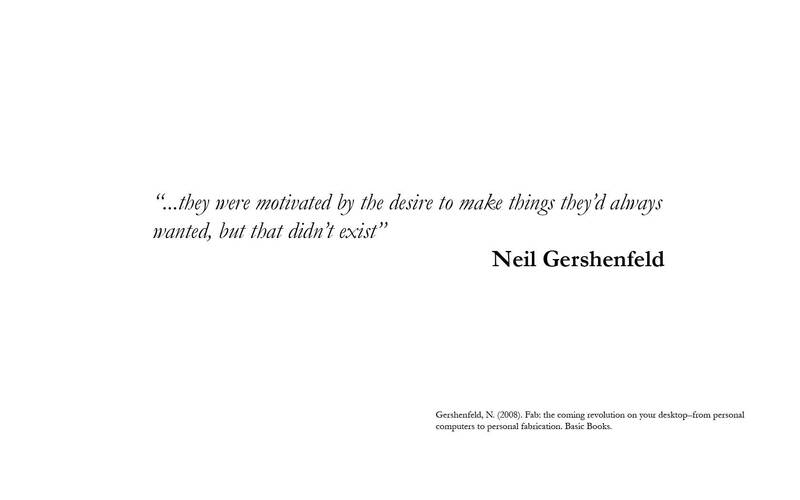 Neil Gershenfeld was one of the founders of the concept of FabLab, which evolved from is course ‘How to make (almost) anything’ at MIT. The motivation for his students to join the course seems quite clear. In 2014 Local Motors made a conceptual car using mostly 3D printed parts. 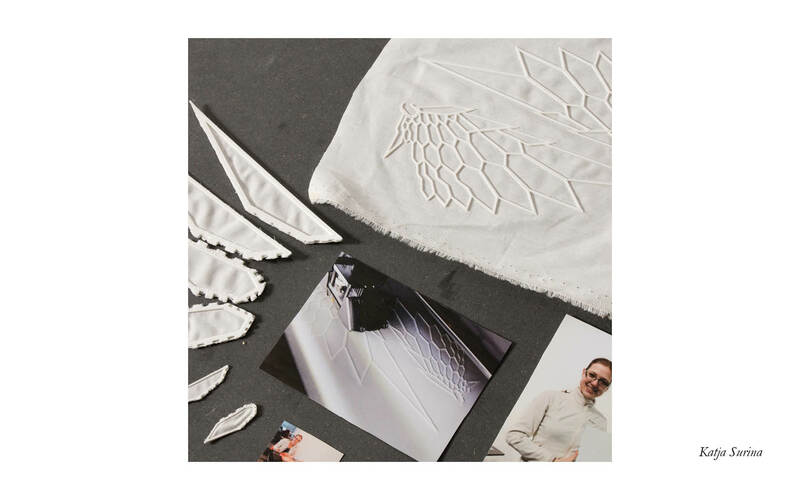 It proved the fact that it is possible to make almost anything with a 3D printer, but the end result may be different that what we expected it to be at the beginning. Before I pass on the word to my team, I would like to show some of the other project that were done in the 1-week workshop we held at the end of the elective course held at AHO.